Cayote squash in english is Seeme thoushe in konkani and Seeme badnekayi in kannada a vegetable which is available almost all the year round. 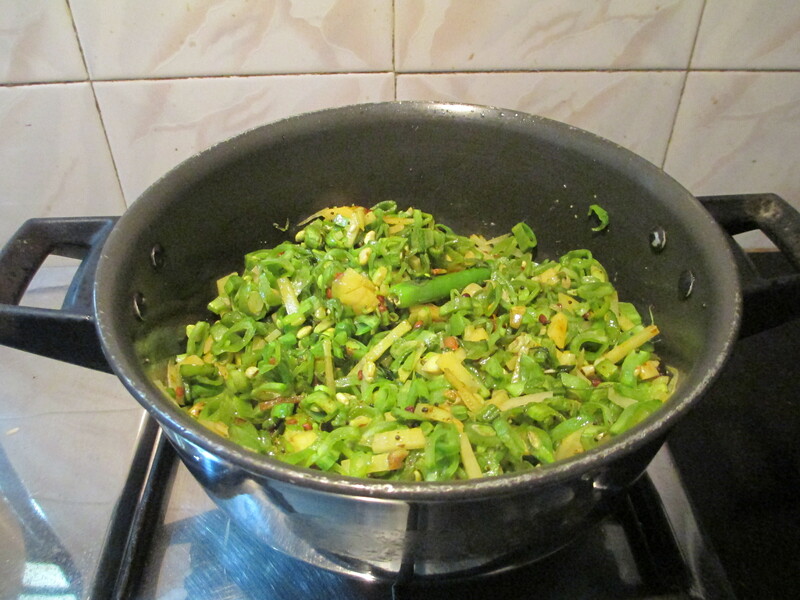 It belongs to the squash family and can be used in stir fry, sambars, kurma etc. Actually as we consume the tender leaves and shoots of the other squash plants the stem and leaves of this plant can also be consumed i believe. This veggie is actually cooked and taken care to see that it is not over cooked and is crispy when done. W heather cooked or raw it is a good source of vitamin c. Here goes the simple recipe of palya which is even loved by kids!!! 1. 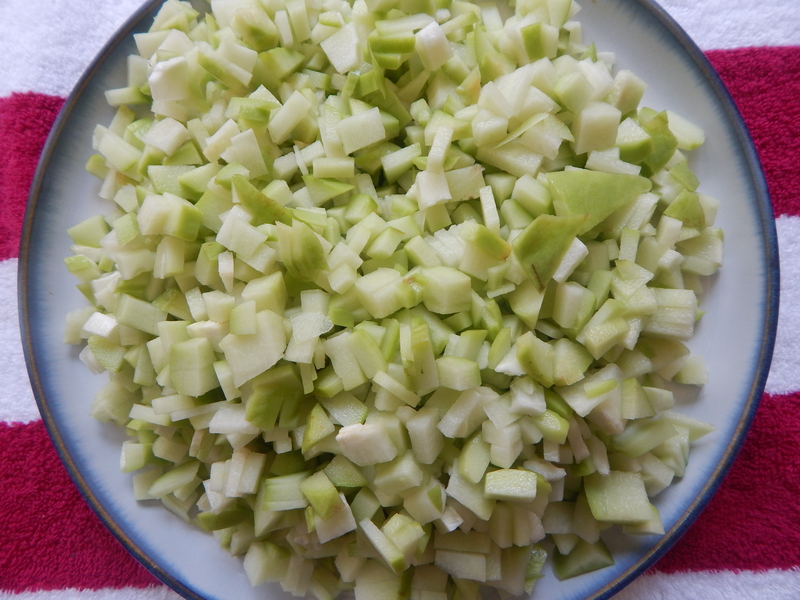 Chop the cayote squash vegetable fine, slit green chili, and grate coconut and keep it aside. 3. 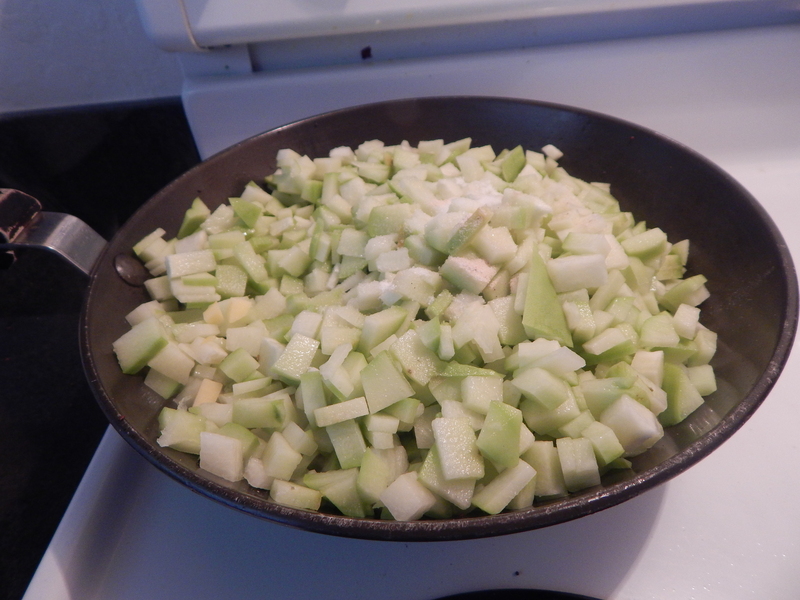 Add chopped cayote squash to it along with salt, sugar and close it with a lid simmering the flame. 4. 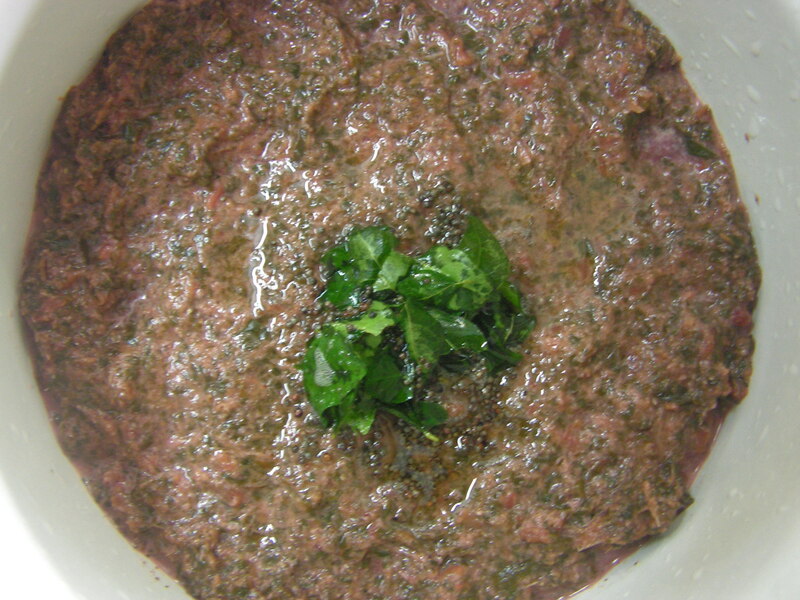 When done, transfer it to another bowl for a closer view of the dish. As usual yummmmmmmmmmmmmm!!! !Enjoy with rice and rasam/dal. Good to remember: 1. 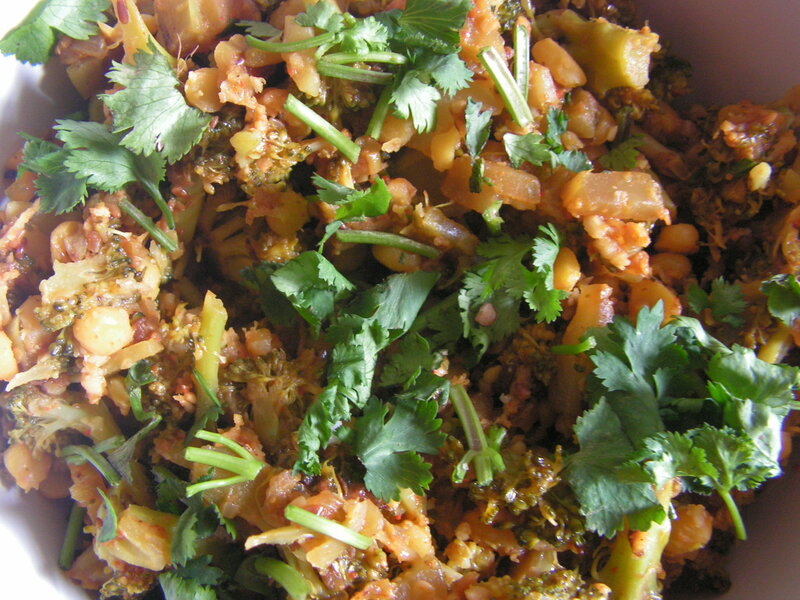 Use tender vegetable for the dish as it tastes better and also cooks well. 2. I have added potatoes to just mix up . It gives a unique flavour to the dish. 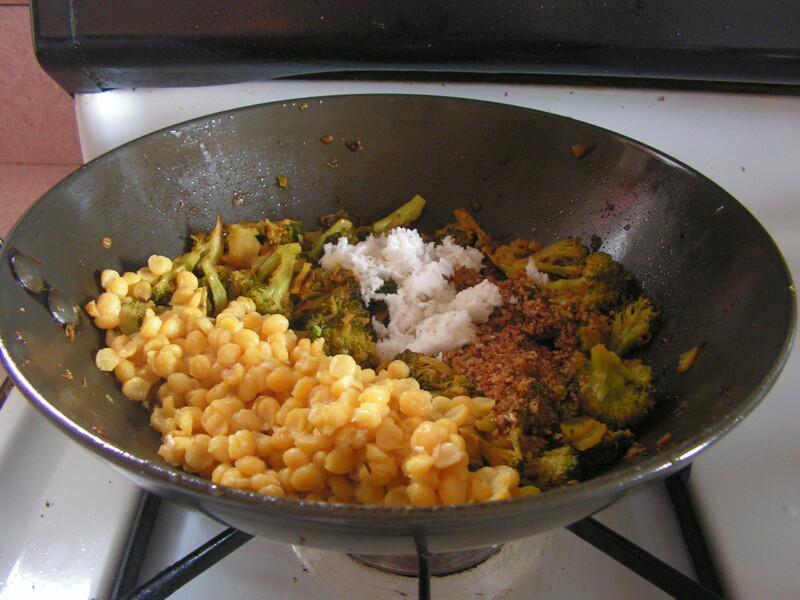 This entry was posted in Uncategorized and tagged Cayote vegetale dishes, Lunch side dish. 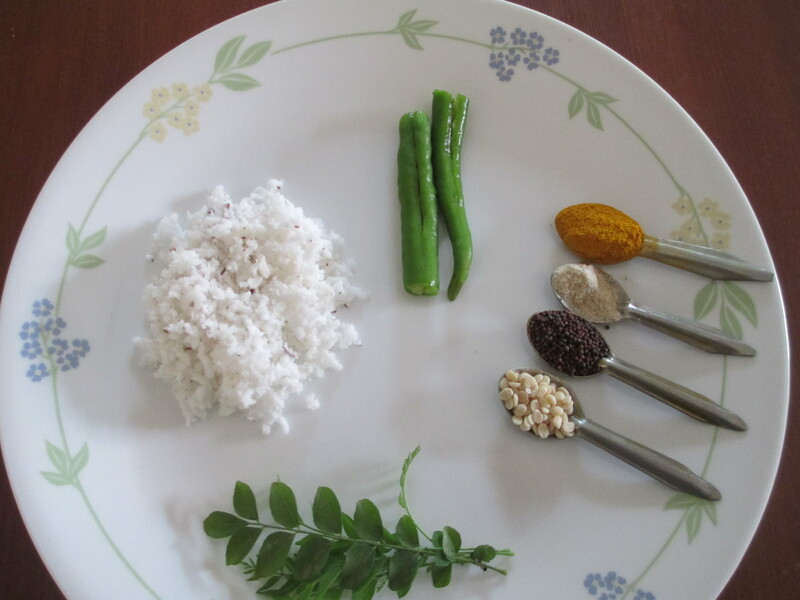 Cluster beans/Midke sanga/gori kayi/gavar bean in english, konkani, kannada, marati is though not very popular yet is an annual legume and a source of guvar gum . 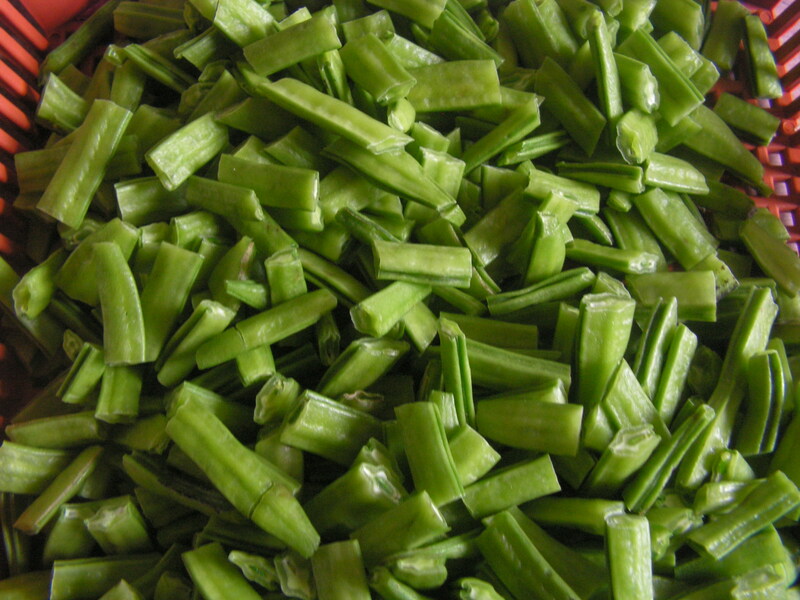 Cluster beans is good for diabetics as it is a good source of fiber content among all vegetables as it prevents a rapid rise in blood sugar levels and also cholesterol. 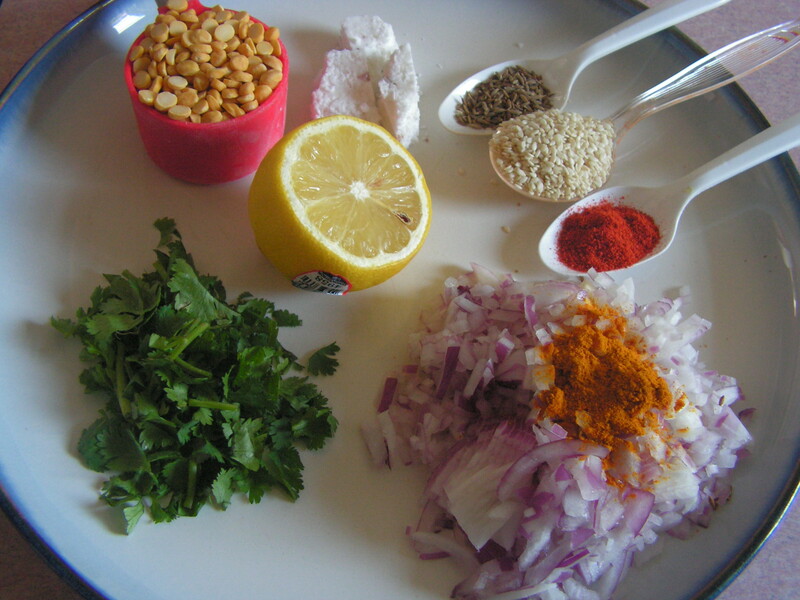 Though it is not the favorite in the list of any body it is an integral part of Rajasthani cooking. 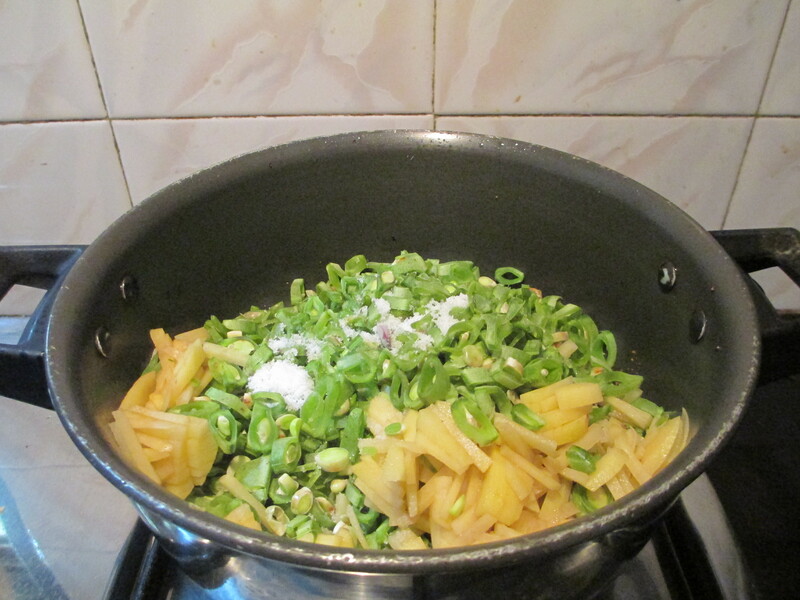 I have already put up cluster beans curry and today it is the beans in coconut gravy which we call nonche. Here it goes…. 1. 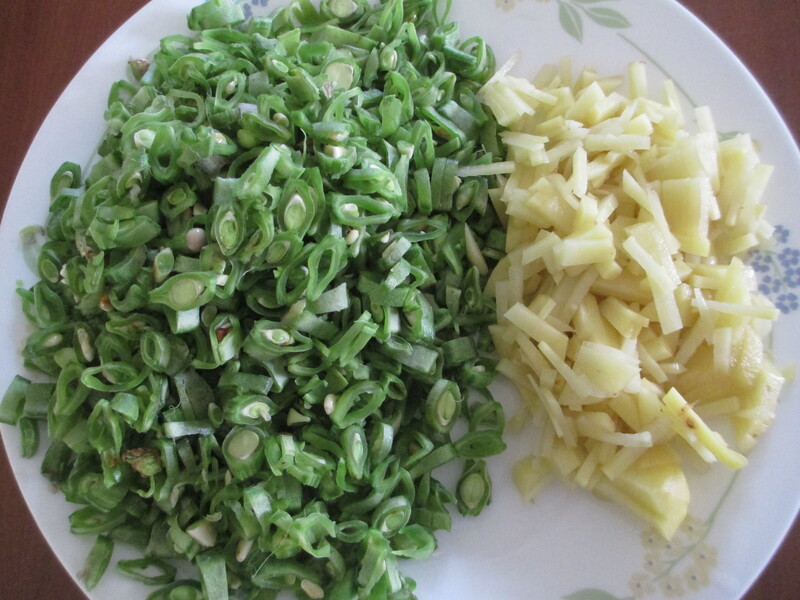 Wash, chop cluster beans as shown in the image and apply salt and keep it aside for a while. 2. 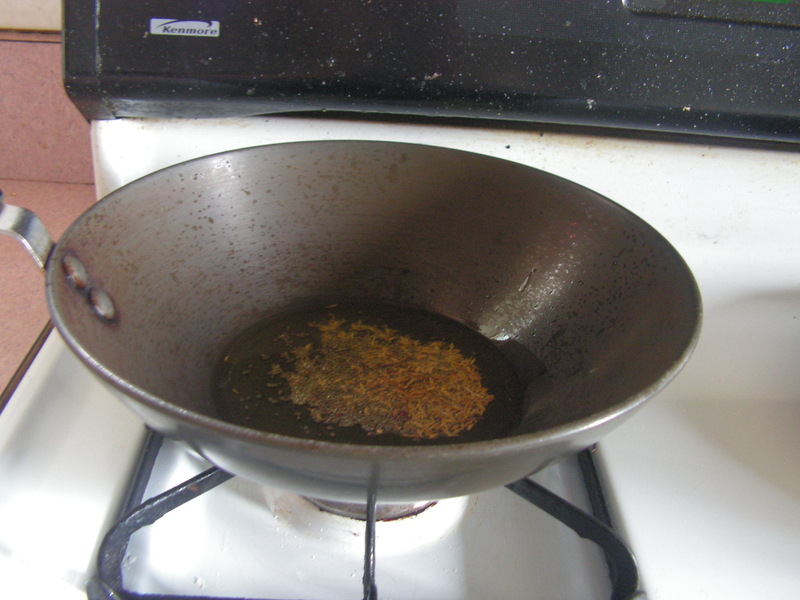 Place a skillet with 1 cup of cooking oil in it on medium flame. 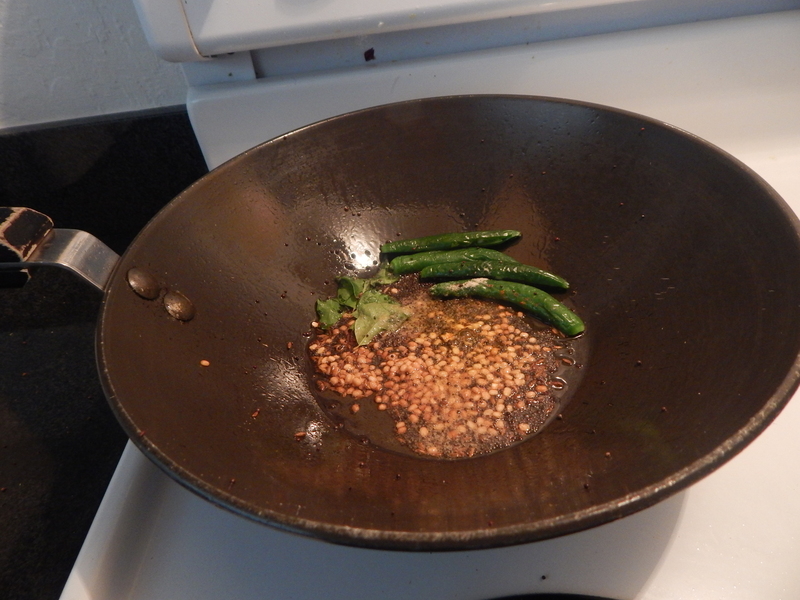 When heated just squeeze out the bean a little and fry it in oil till crispy and light brown. 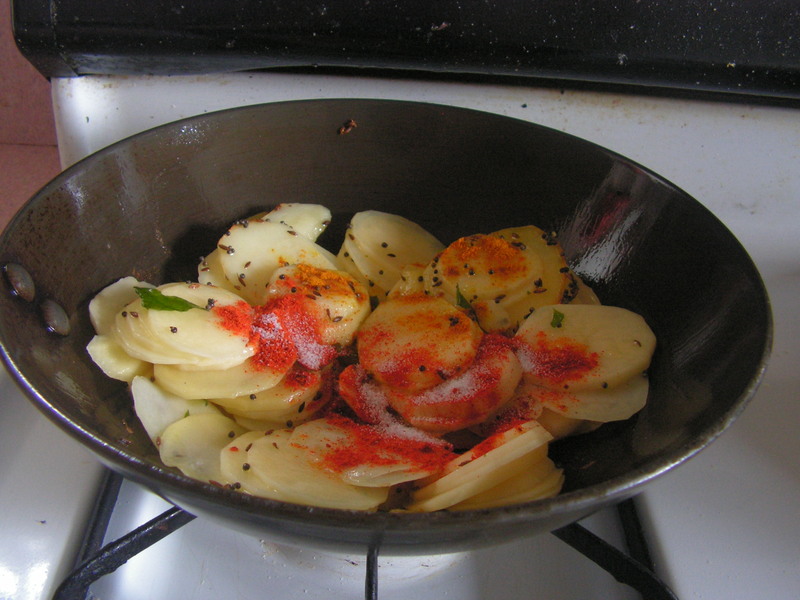 It could roughly take 15 minutes OR cook it in the cooker adding a little salt till soft. 1. 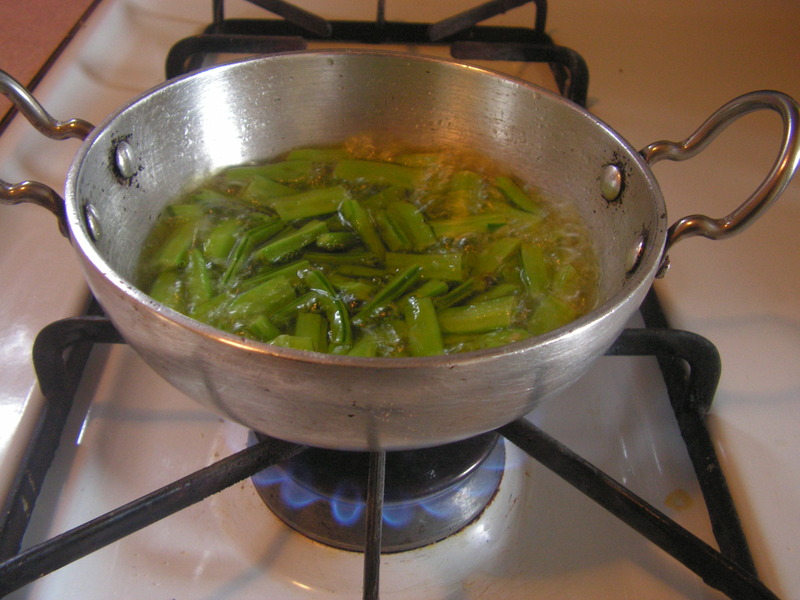 Use fresh and tender cluster beans for the dish. 2. One can make the dish spicy if needed. 3. 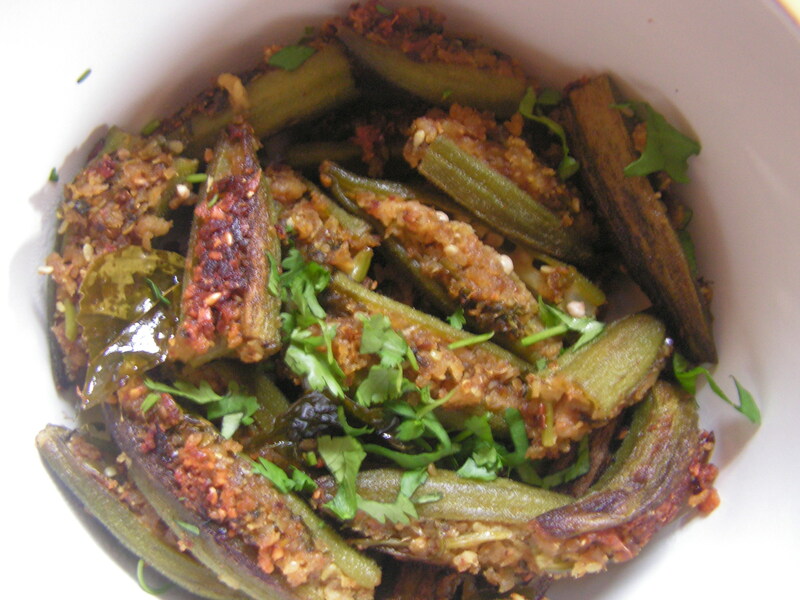 Bilimbi can be used in place of tamarind. 4. One can even cook the bean in cooker and mix it to the masala. 5. 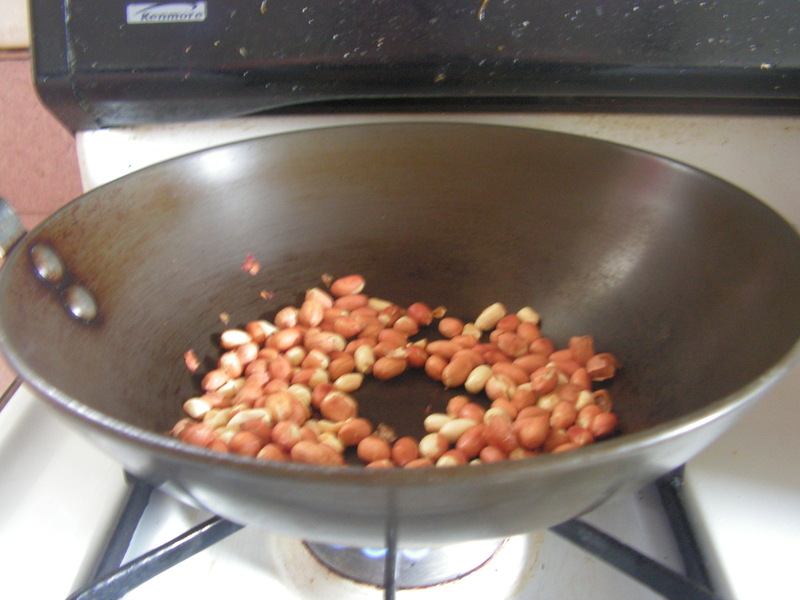 While i have shown frying of beans, but have added cooked beans as i had not clicked that photo. 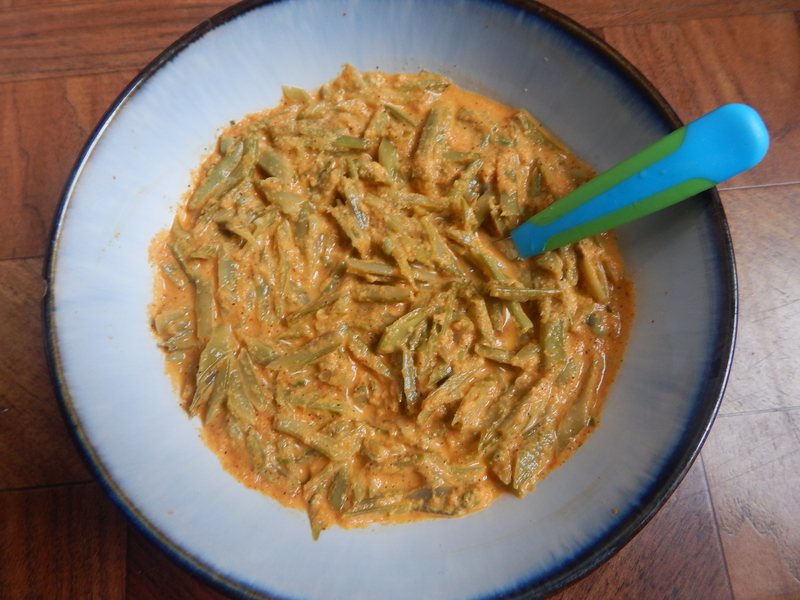 This entry was posted in Uncategorized and tagged Cluster bean dishes, Lunch side dish, Nonche. 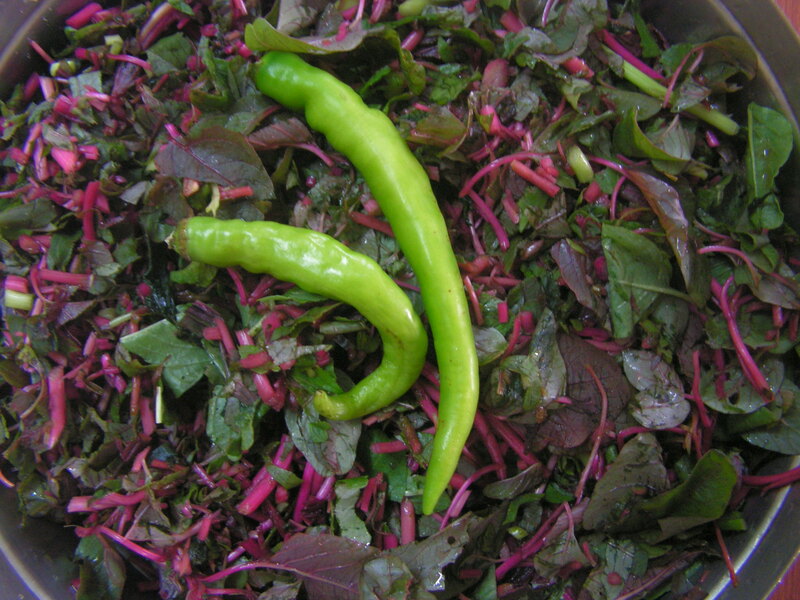 Red Amaranth leaves , Spinach’s lesser cousin these edible greens have always been a part of indian traditional cooking. Though little different in taste Is available in two colours, and red seems to be the most popular one. Amaranth has been found to be a good home remedy for premature greying and hair loss too. 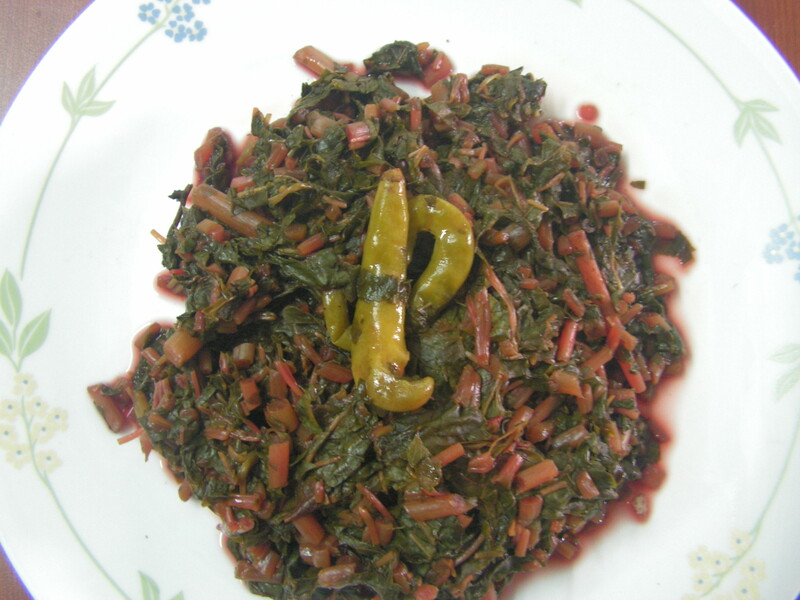 I have put up Red Amaranth leaves masala a couple of years ago and today i would like to put up a side dish also a semi dry dish called sasam/sasmi. Good to remember: 1. 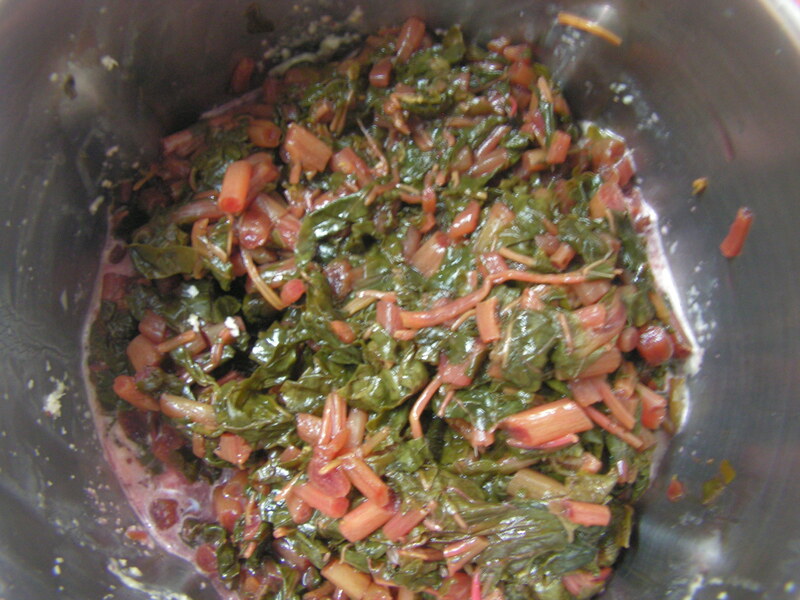 Always use fresh Amaranth leaves for the dish for better flavour. 2. Chop it very fine as well so that it cooks well. 3. 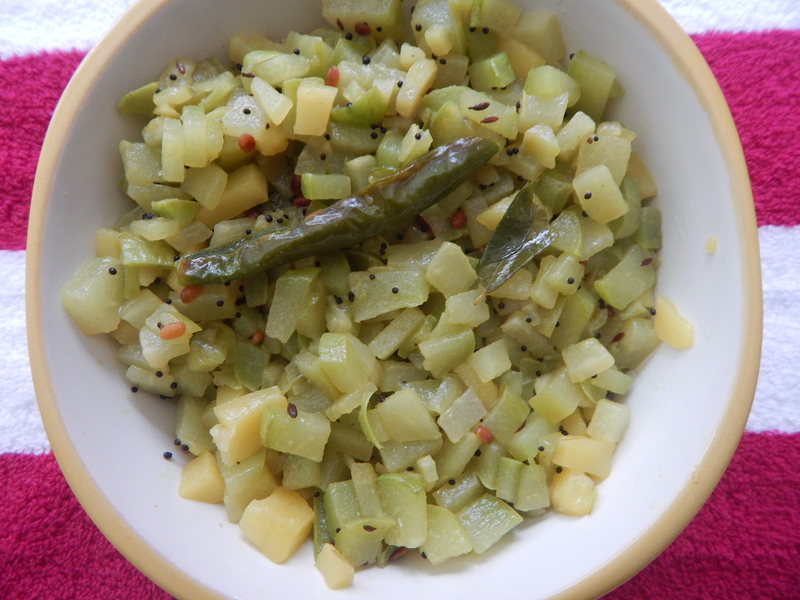 One can use curds in place of Bilimbi. 4. A pinch of sugar enhances the flavour of the dish. 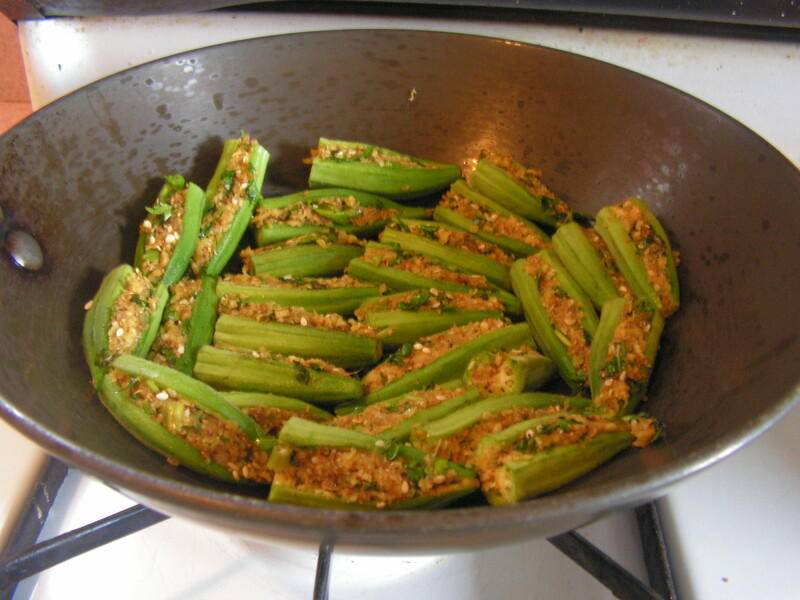 This entry was posted in Uncategorized and tagged Amaranth leaves dishes, Lunch side dish. Broccoli’s nutritional profile is very impressive. It contains high level of fiber (both soluble and insoluble) and is also a very rich source of vitamin c. Eating broccoli promotes the production of enzymes that help protect heart blood vessels and reduce the molecules that damage them. Over recent years researchers all over the world have identified a wide range of therapeutic properties associated with broccoli. 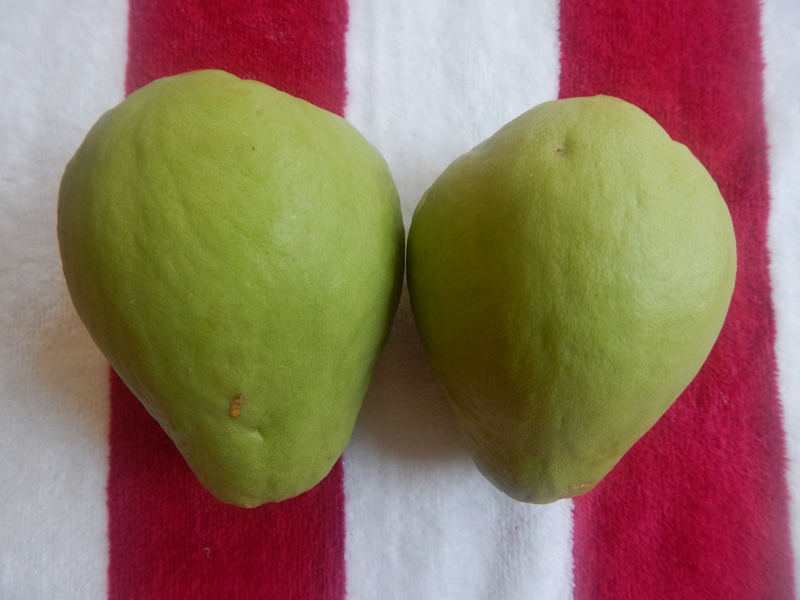 So apart from being a nutritional power house, it has lot more health benefits. 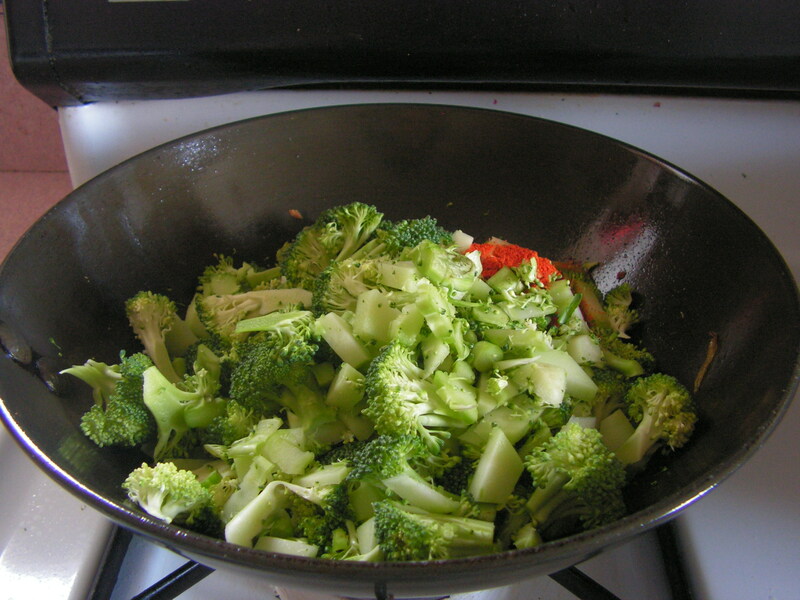 Eat Broccoli lightly steamed and eating raw is strongly recommended to gain the optimum benefit of the veggie. It also fights against Cancer and reverses the Diabetes heart damage. 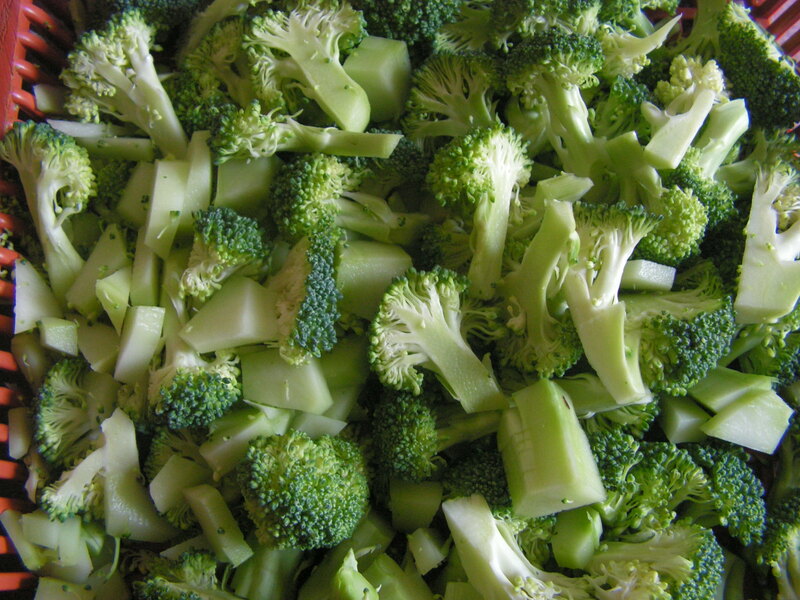 Broccoli may also prevent skin cancer not by eating though but by applying it to the skin. Knowing so much of goodness of the veggie why not consume if available????? I have put up “Broccoli paratha” a few weeks back on this blog and today i would love to put up this sir fry recipe of this healthy veggie. When we were in the U.S for the last 6 months i prepared a few dishes a couple of times and would like to share with you all now. 1. Wash, chop and pat dry Broccoli , pealing ultra stem pieces and cut into bite size flowrets and keep it aside as shown in image-2. 2. Wash , peal and chop onions fine and keep it aside. Soak chick pea dal in water for about 30 minutes and in the cooker till done and keep it aside. 4. 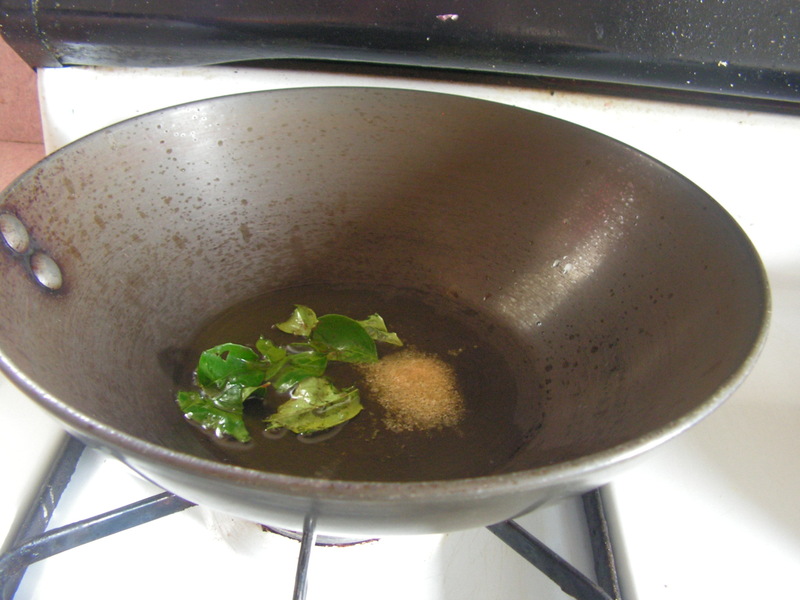 Place a skillet with 2 teaspoons of cooking oil in it on medium flame. 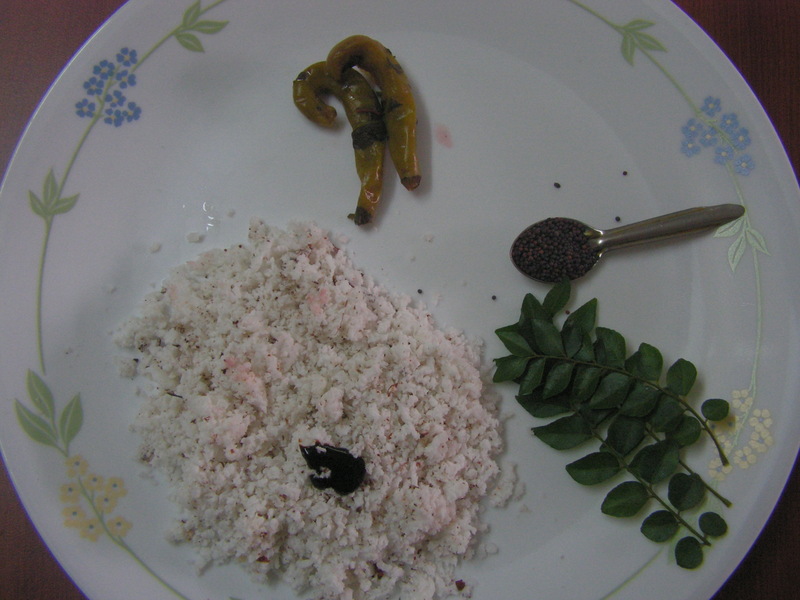 When heated add cumin seeds to it and when it splutters add curry leaves to it and fry till done. 1. Use fresh Broccoli for better taste. One can even half cook the veggie as i feel you are consuming it healthy!!!! 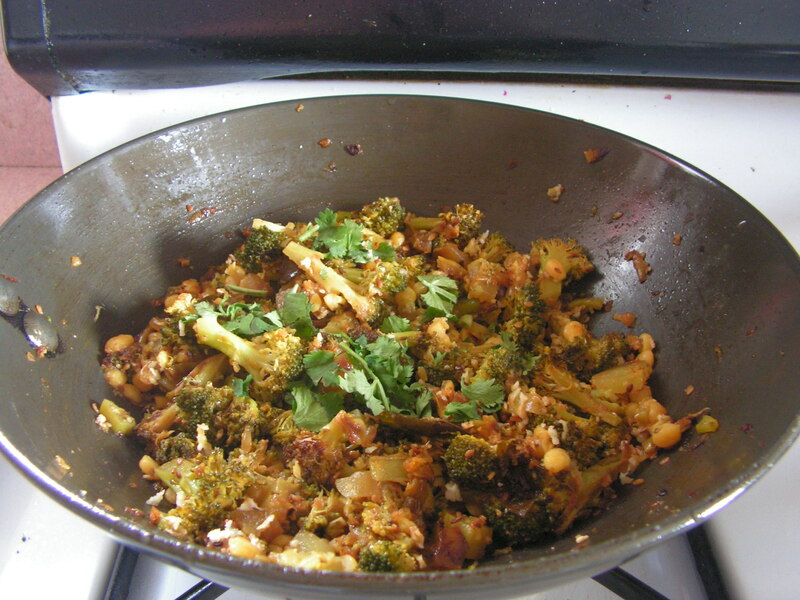 This entry was posted in Uncategorized and tagged Broccoli dishes, Lunch side dish. 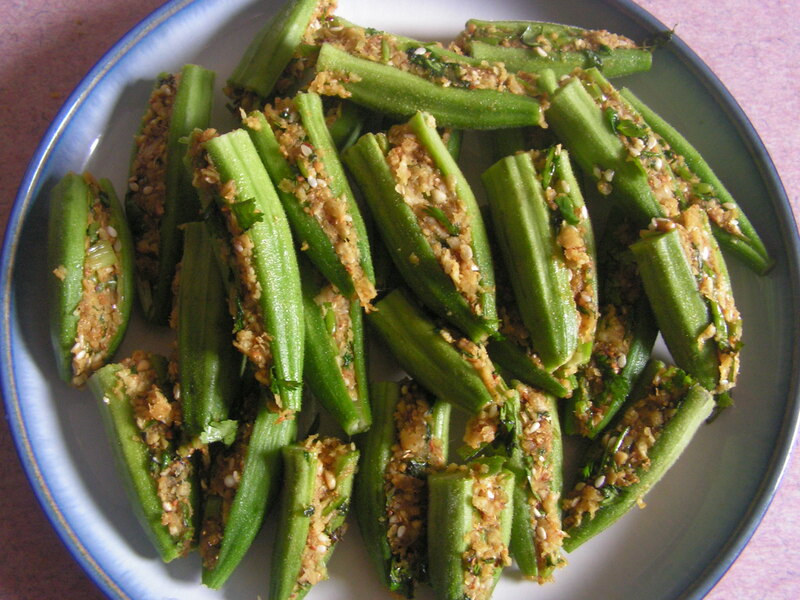 Okra/Ladys finger/Bendekayi/Bhenda in english, kannada and konkani respectively is very good from the health point of view. 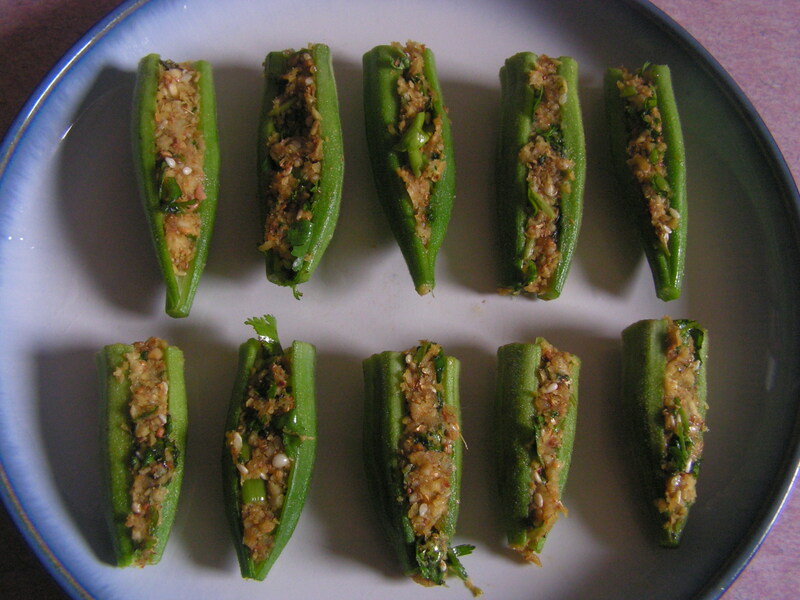 It can be easily grown in the kitchen garden without much effort etc., I have already put up Okra dosa, okra stir fry, Benda sagle( a favorite dish of my family) Today i would like to put up stuffed okra(gujrathi style) and here goes my version of the recipe…. 1. 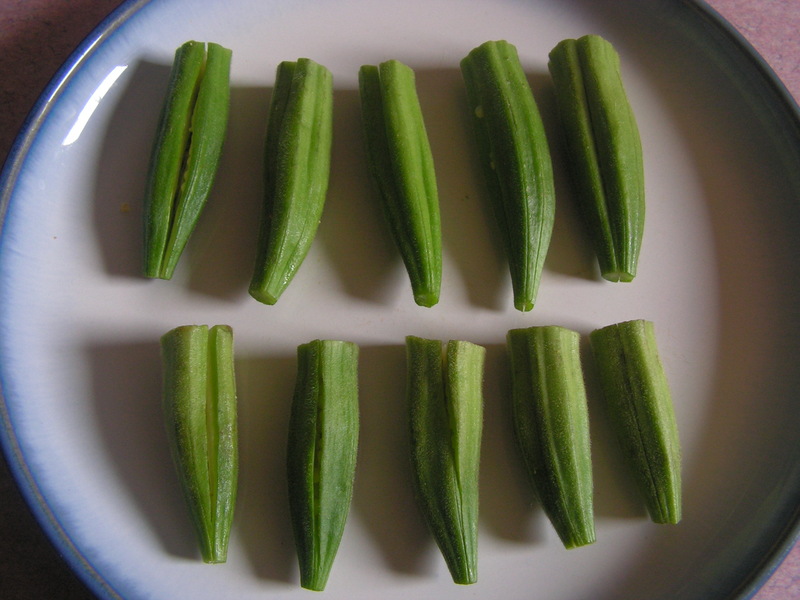 Wash okra, pat dry and slit lengthwise as shown in the image below. 2. 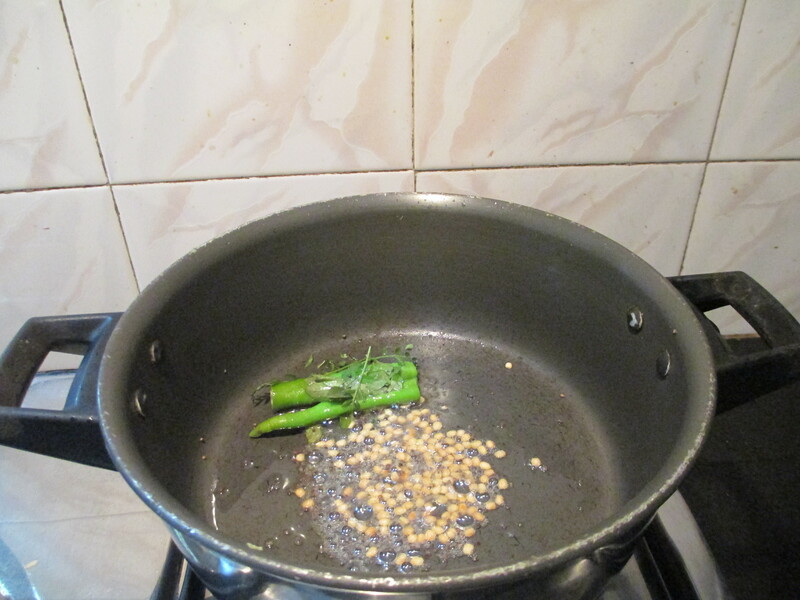 Place a spatula with coriander seeds in it and dry roast till you get a pleasant aroma. Corsely powder it on cooling. 3. 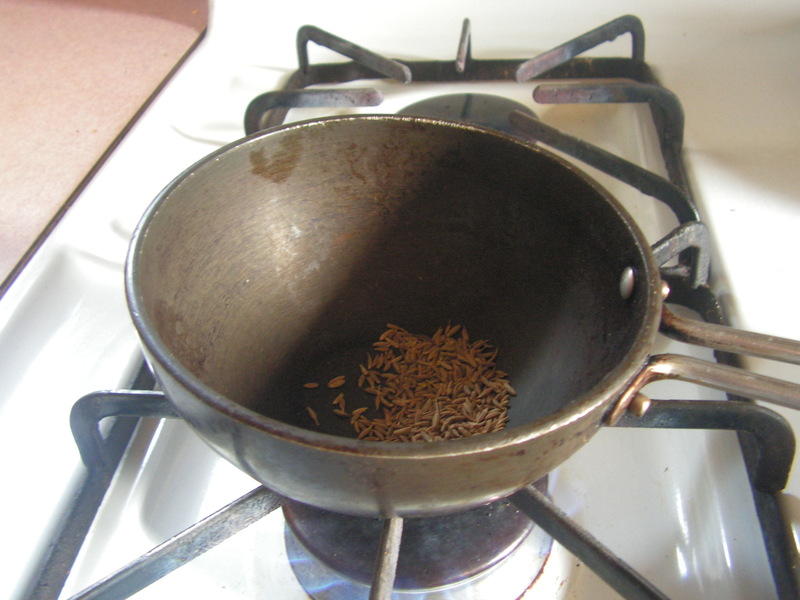 Also dry roast cumin seeds till it splutters. 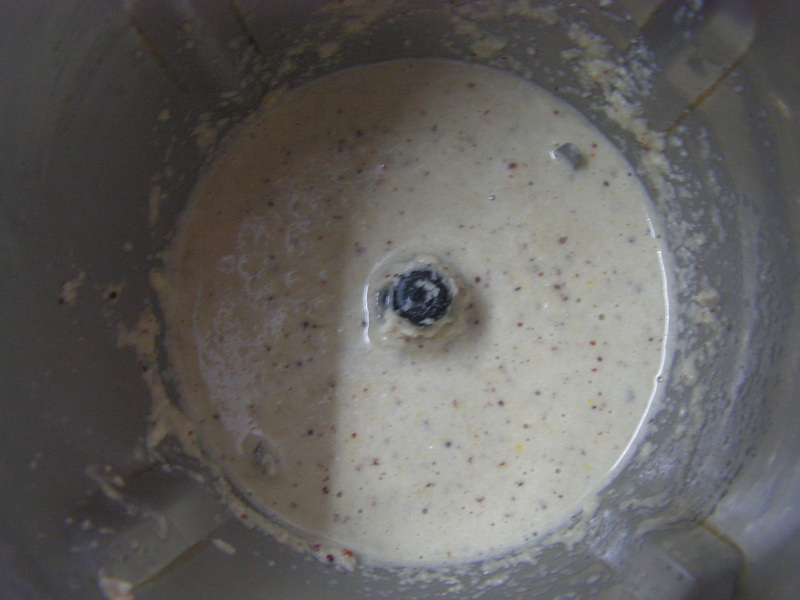 On cooling powder it in the mixer. 4. 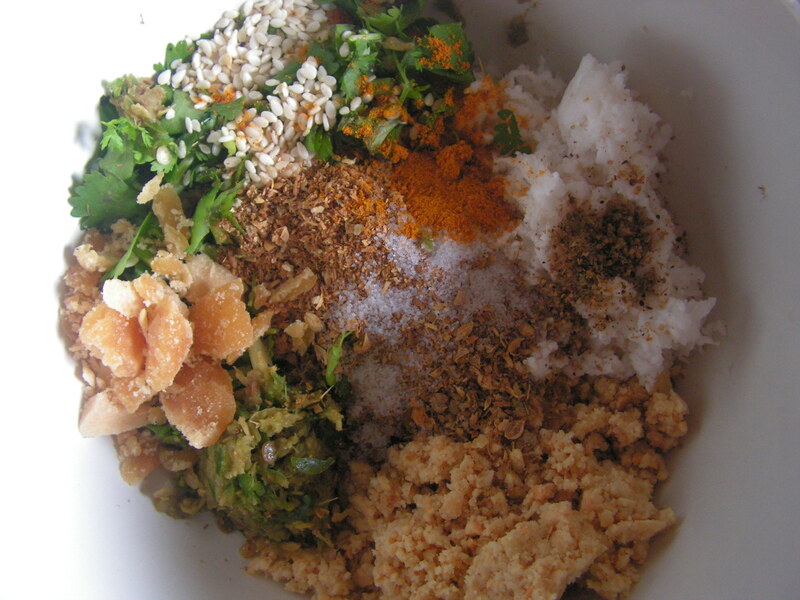 Transfer all the stuffing ingredients into a broad bowl. 6. 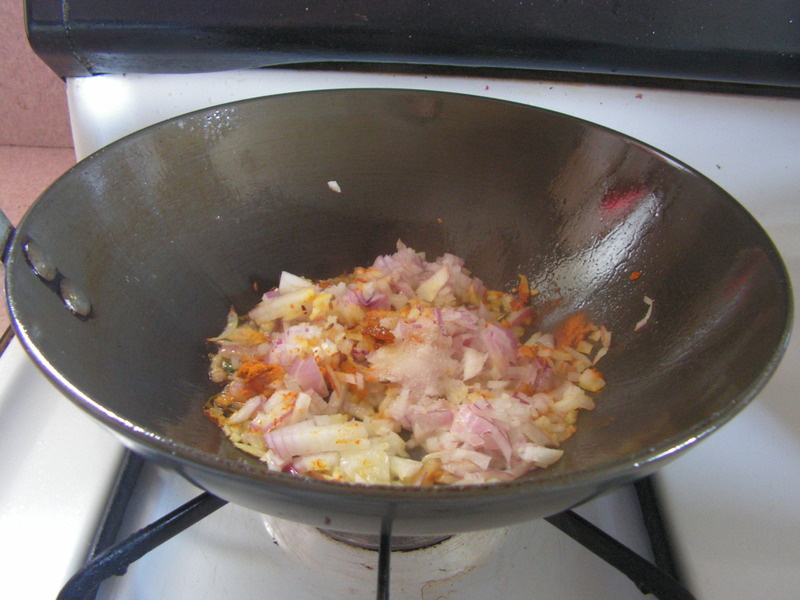 Place a wide skillet on medium flame with 2 Tablespoons of cooking oil in it. 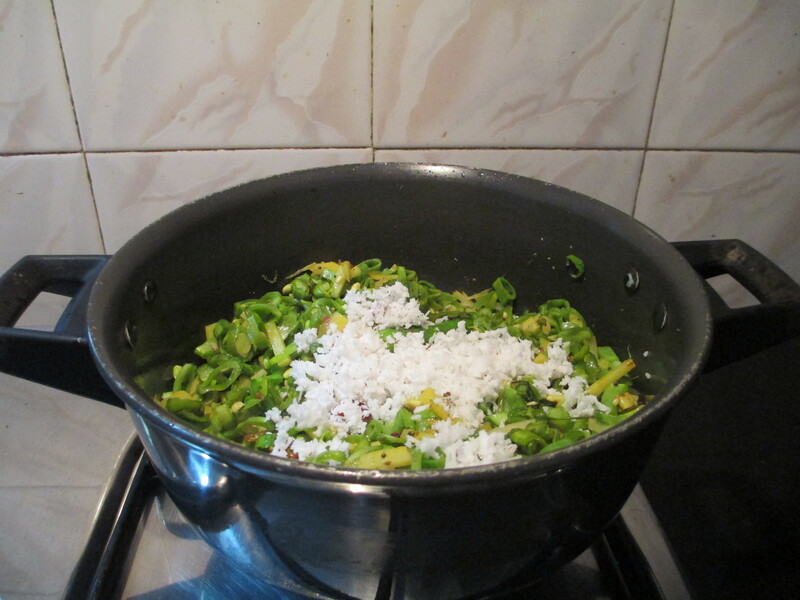 On heating add asafoetida powder and curry leaves to it. 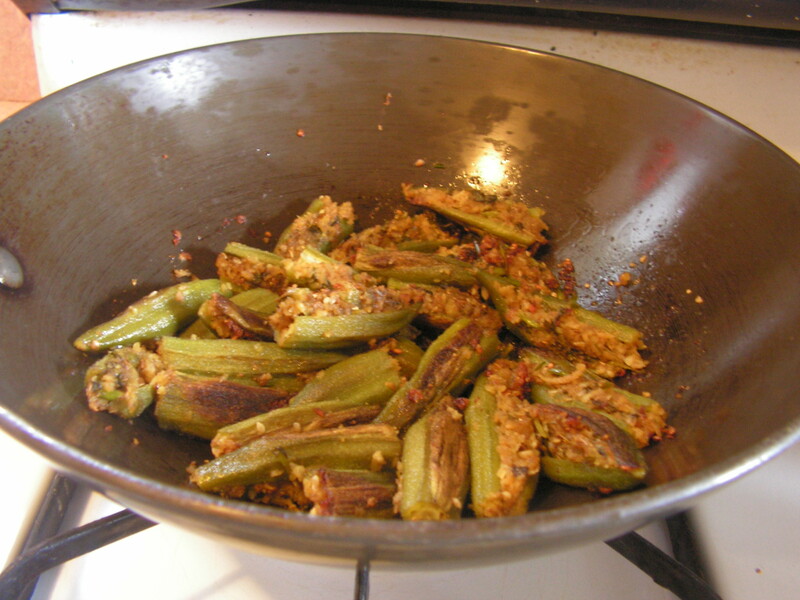 When fried, place the masala stuffed okra in it and close it with a lid simmering the flame. 7. Keep a watch and flip it with a wooden spatula, so that it is not crushed. When cooked would be as below. 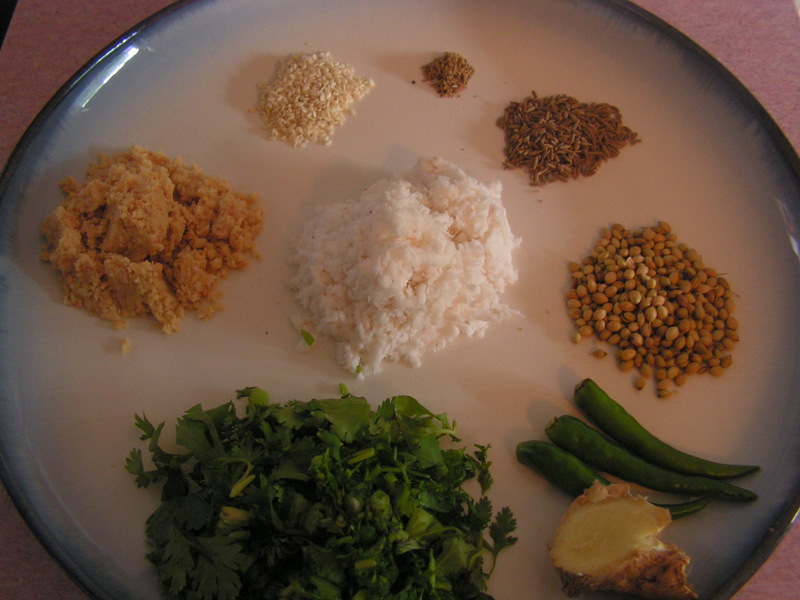 Sprinkle cilantro and serve hot with rice and dal. 1. 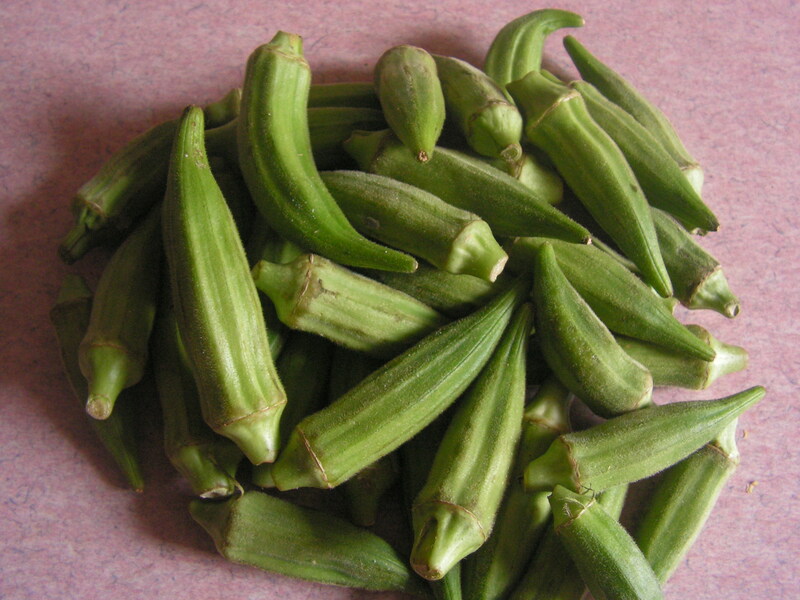 Use fresh and tender okra for the dish for better flavour. 2. 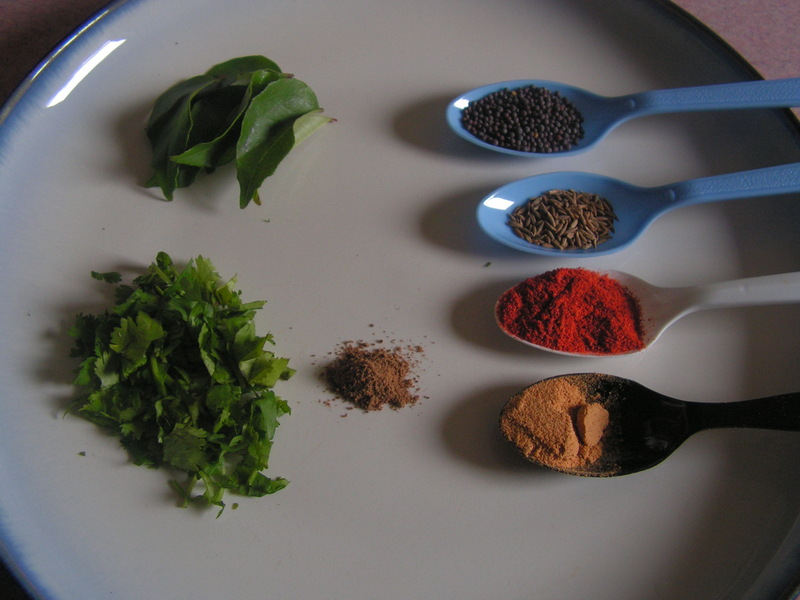 Cut lengthwise in such a way that the masala does not come out as shown in the image. 3. Use jaggery as per your pallot. 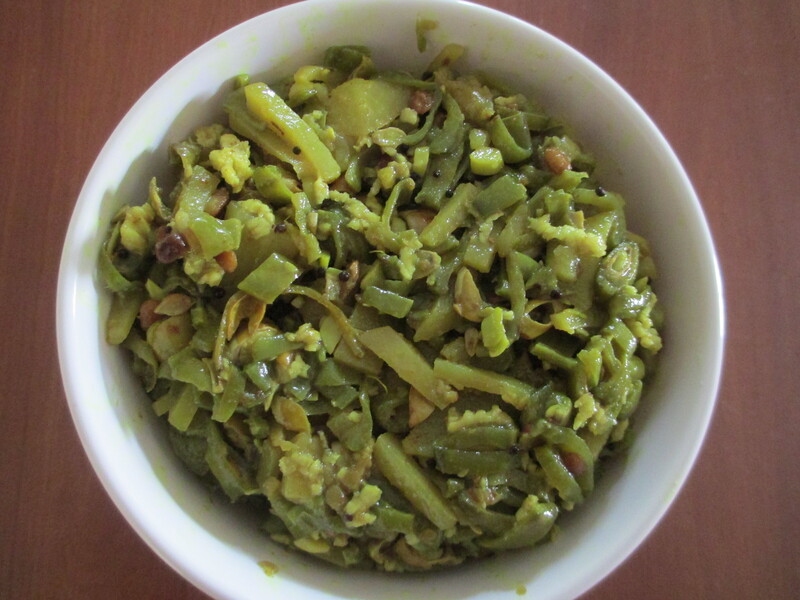 This entry was posted in Uncategorized and tagged Gujarathi dishes, Lunch side dish, Okra dishes. 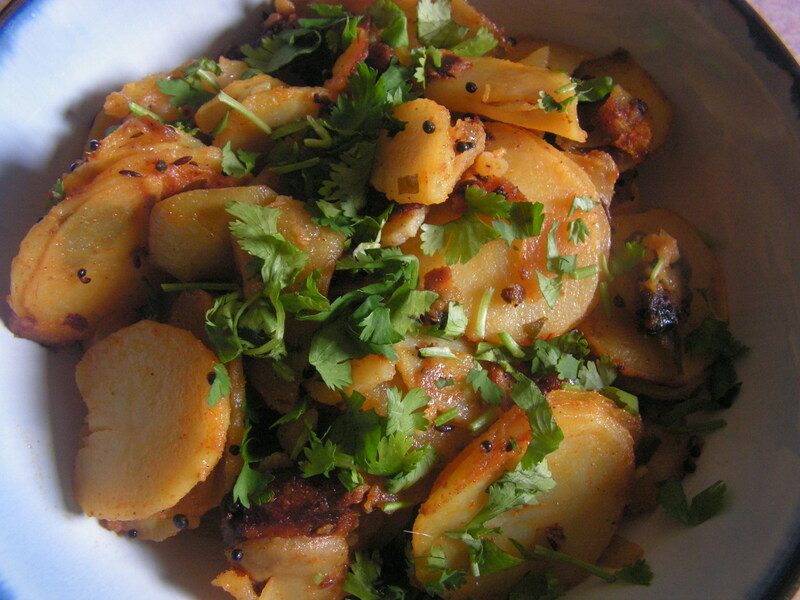 Potato the king of vegetables and one of my favorite veggie is used in versatile dishes. I thought of sharing this simple yet an easy for the reason that it is not only easy for any armature but also to the bachelors for sure. The reason being that other than chopping of potato all other ingredients are always at home in the pantry. So i thought of sharing it with you all being so excited not only to eat but to get complemented!!! 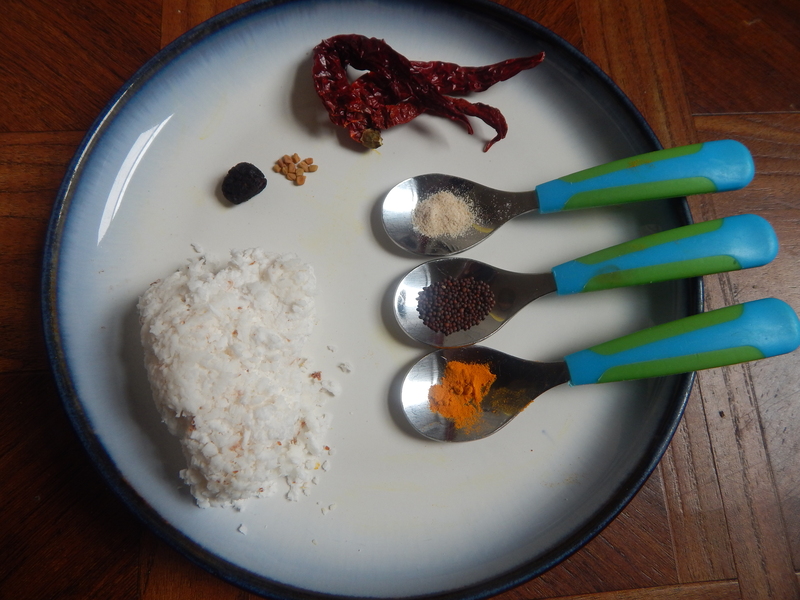 Here is my version of the recipe…. 1. 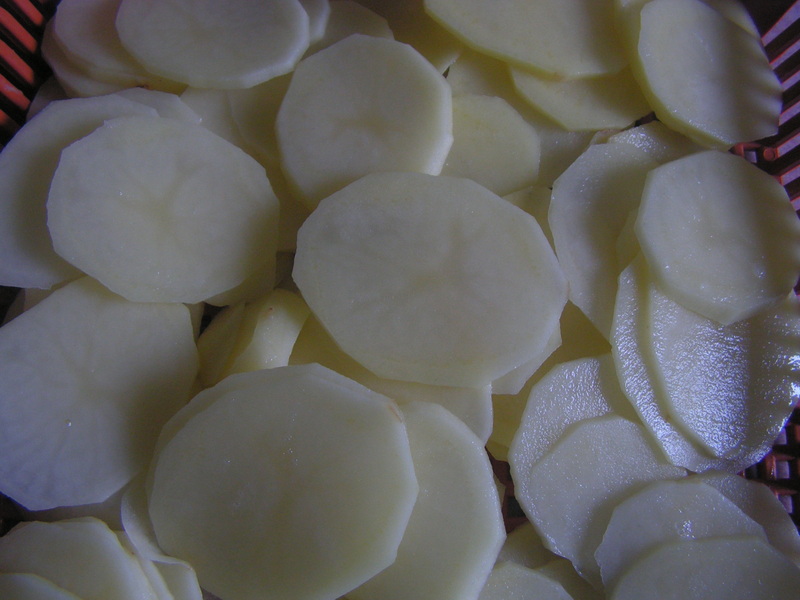 Wash peal and chop potatoes in medium size slices. Soak it in a bowl of water for a while. 2. 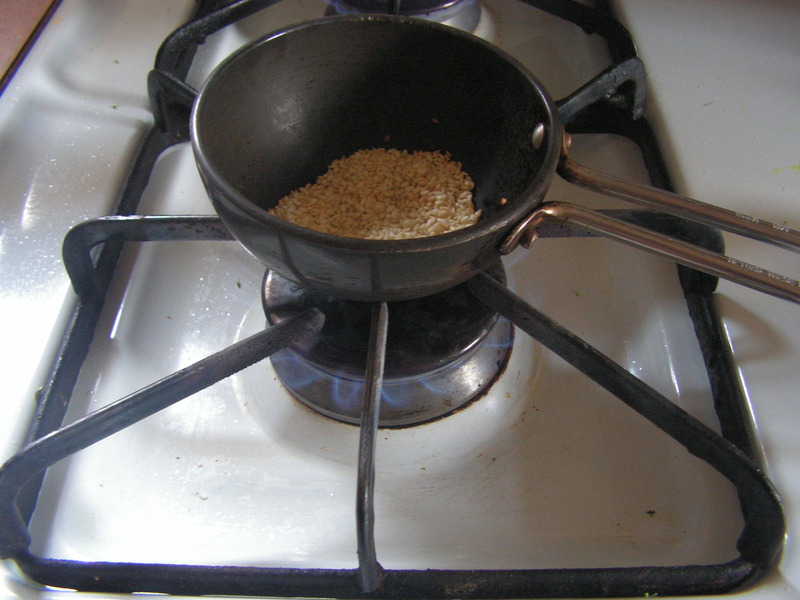 Place a wide skillet with 2 teaspoons of cooking oil in it on medium flame. 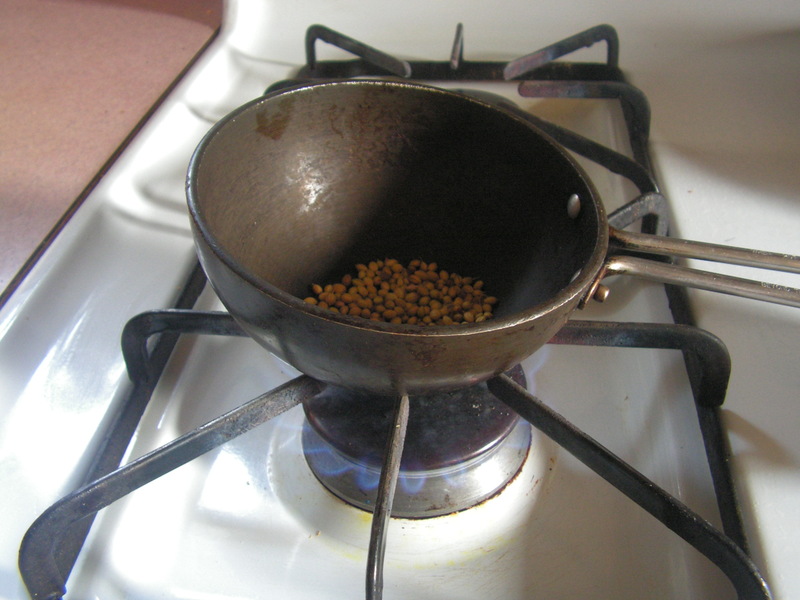 On heating, add mustard seeds to it. 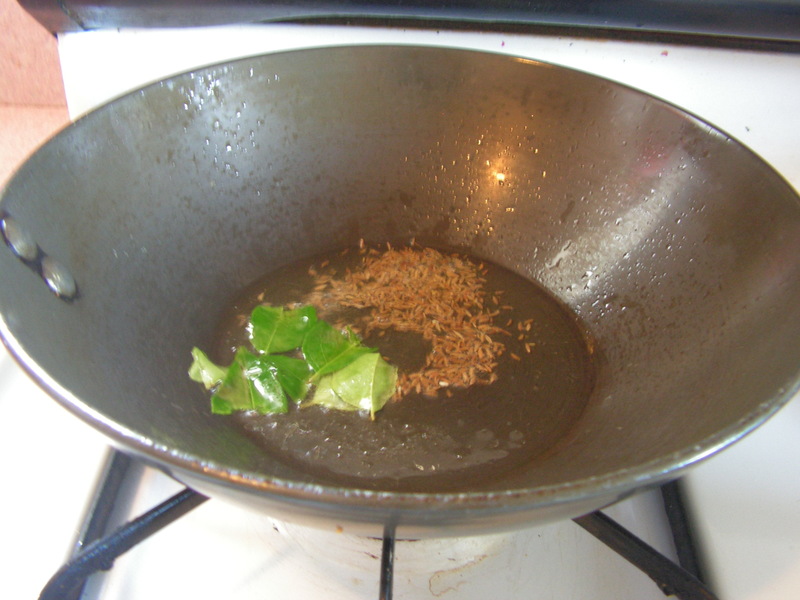 When it starts to splutter, add cumin seeds to it. 6. Transfer it to a serving bowl for a view. If you love dry dish for chapati you can relish it with roti and chapati or one can even relish it with rice and dal. 1. 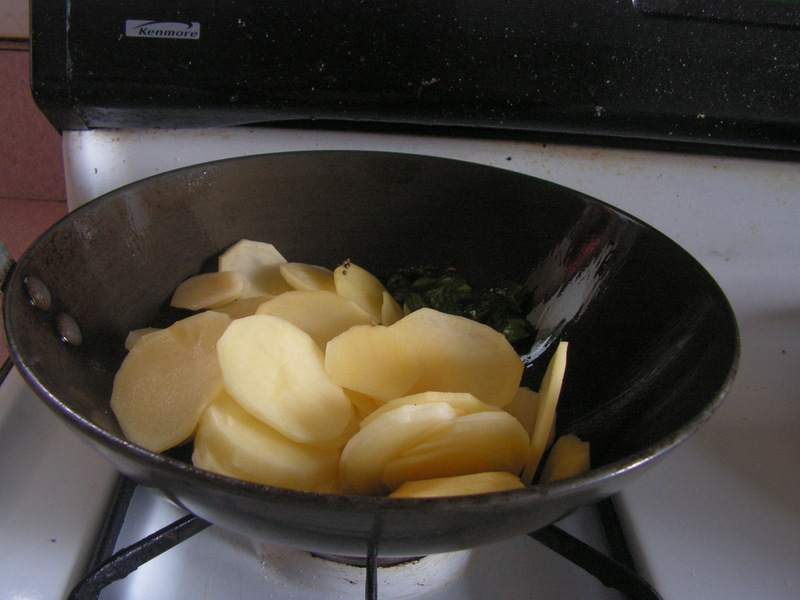 Fresh and medium size potatoes serve the purpose. 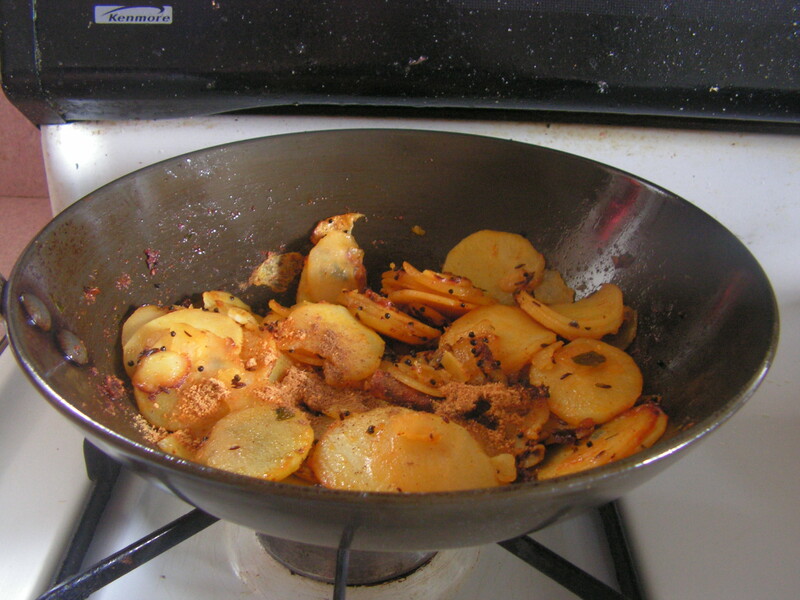 This entry was posted in Uncategorized and tagged Lunch side dish, Potato dishes.